Formerly red velvet; rebound in blind-tooled tan morocco with red morocco case, both by Marguerite Duprez Lahey. Purchased by J. Pierpont Morgan (1837-1913) in 1902. Arms of Eu family in several initials (possibly Philippe d'Artois, comte d Eu, son-in-law of the Duke of Berry); later in Spain; Howell Wills sale (London, Jul. 11, 1894, no. 110) to Pickering for Richard Bennett; Catalogue of manuscripts and early printed books from the libraries of William Morris, Richard Bennett, Bertram, fourth Earl of Ashburnham, and other sources, no. 13; purchased by J. Pierpont Morgan (1837-1913) with the Bennett Collection in 1902; J.P. Morgan (1867-1943). 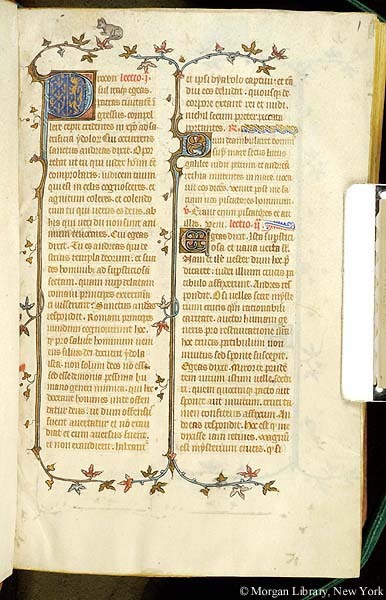 Breviary for the use of Rome, according to the Franciscan rite; written and illuminated in Paris, France, late 14th century; on fol. 512-520 there are prayers in a later hand that perhaps is Catalan; these prayers are dated 1458 on fol. 520r. Decoration: 1 miniature on fol. 29; many illuminated initials, marginal animals, birds, insects, and human figures; arms of France impaled with Burgundy and arms of Eu family (azure a lion rampant or among gouttes (?) or billets (?) of same, in initials or in marginal decoration. Artist: perhaps illuminated by a follower of Jean Pucelle.